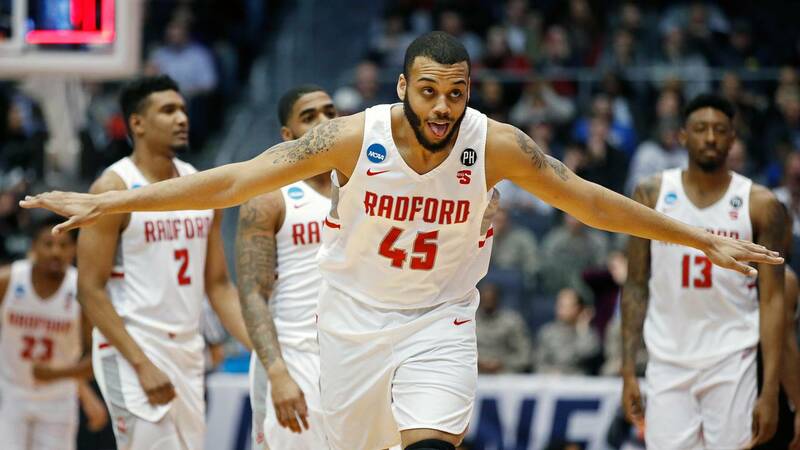 Darius Bolstad #45 of the Radford Highlanders celebrate his teams victory over the Long Island Blackbirds in the First Four game in the 2018 NCAA Men's Basketball Tournament at UD Arena on March 13, 2018 in Dayton, Ohio. The Radford Highlanders got the first win of the 2018 NCAA Tournament, and their first Tourney win ever, downing LIU Brooklyn 71-61 in a battle of No. 16 seeds. Radford will face the No. 1 seed in the East Region, Villanova, on Thursday. Ed Polite Jr. and Travis Fields Jr. both scored 13 points as the Highlanders (23-12) saw balanced scoring. Two others scored in double figures. Radford also held LIU Brooklyn 16 points below its season scoring average, on the way to the Highlanders eighth straight win. Both teams entered the tournament on a hot streak, with LIU Brooklyn winning their past five games and Radford winning their past seven. The Blackbirds upset top-seeded Wagner on March 6 to win the Northeast Conference title and an automatic bid to the NCAA Tournament. The Highlanders won the Big South Conference title on March 4 with a last-second 3-pointer to beat Liberty. Both teams were seeking their first NCAA Tournament win, with the Blackbirds making their seventh appearance and the Highlanders making only their third appearance in school history. LIU Brooklyn (18-17) entered the tournament with the second-most losses of any team, ahead of only 15-19 Texas Southern.